We love creating and showcasing what our Gravity Forms add-ons can do. 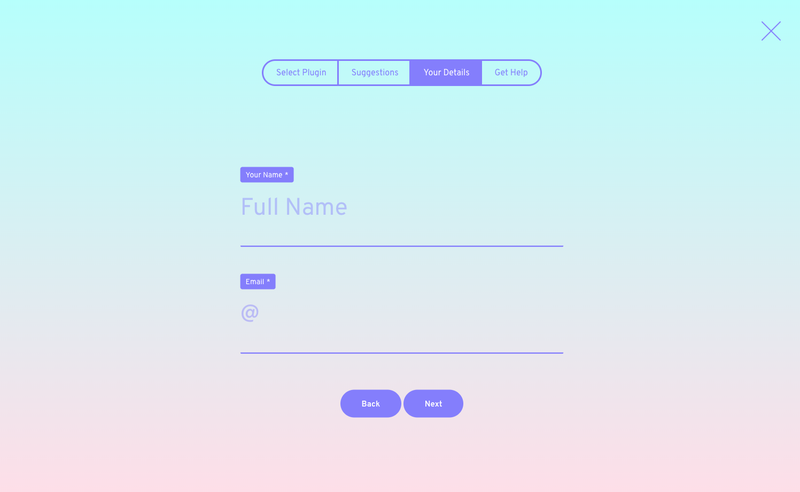 With a bit of creativity and CSS know-how, you can push the boundaries to get your forms looking unique and super interactive. See how we designed and built our updated product support form before it goes live. 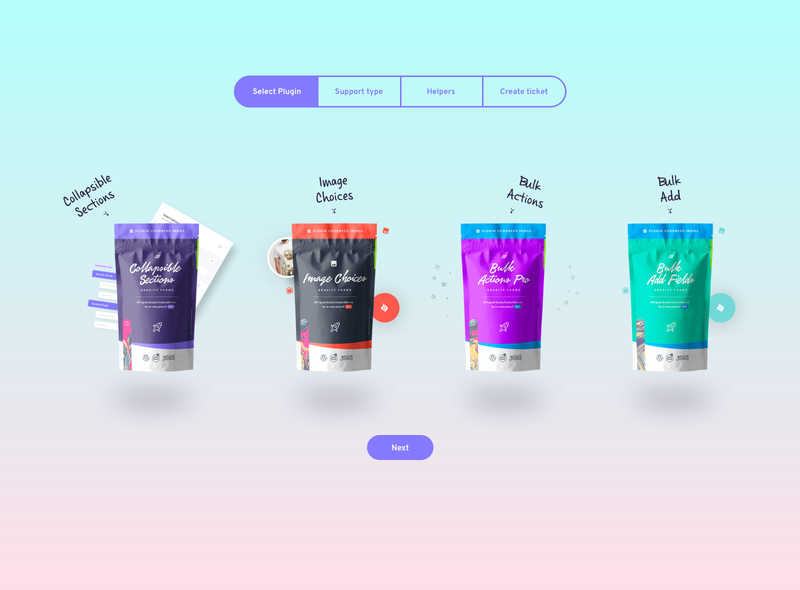 Try the demo and tell us what you think! Do any of these help? What is the difference between duplicate and clone? The quality of the images is terrible! Have you updated to at least v1.1.1? We added the ability to select the image size to use when inserting from the media library. 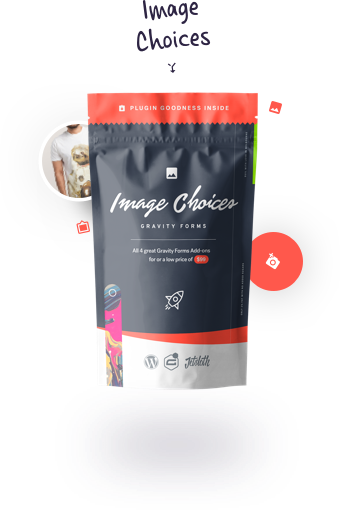 Our examples are purely to demonstrate what is possible with some custom CSS applied to the image choices fields, more so than themes for you to drop in. You're free to use them but they will most likely require at least some further customization to suit your needs. We're aware of this issue and currently working with 3rd party support to try and resolve. We know it's annoying and we do apologise. In the meantime you can either leave the folder name as is and just re-activate the plugin. Or rename the folder back to the original name and then activate. Either way you won't lose any settings or data. The brief was fairly basic. Dramatically improve on our currently stale support form to give the user a more visual and interesting experience. Make sure you test run a live and interactive version of the built form. 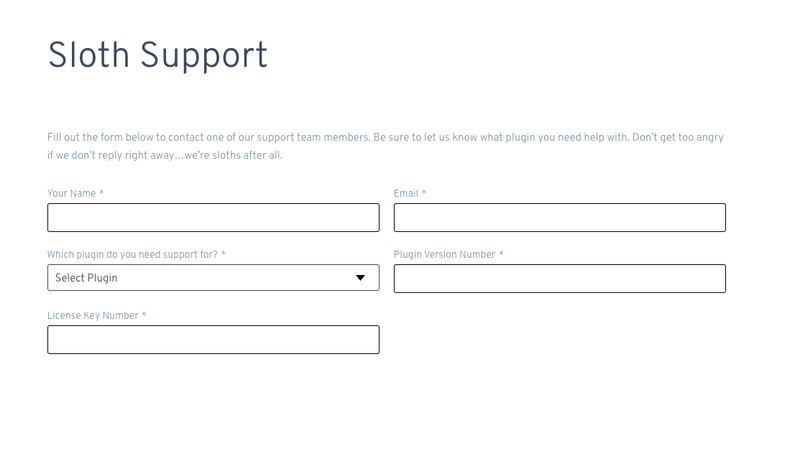 Our support form uses our Image Choices & Collapsible Sections add-ons so make sure you check those out too. The first point of call was to put together a design of what we wanted it to look like. This design would then indicate what assets we needed to prep for the image choices. We knew we wanted an immersive fullscreen experience so the user was focused on simply just submitting their product support enquiry. 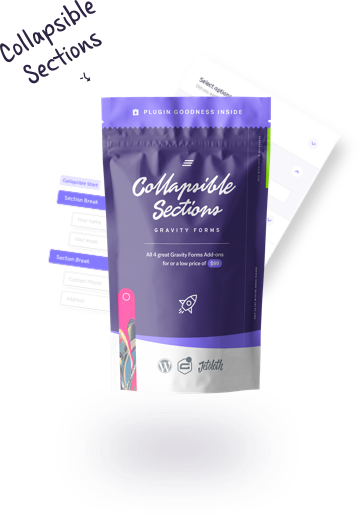 You’ll need a copy of our Image Choices and Collapsible Sections addons. 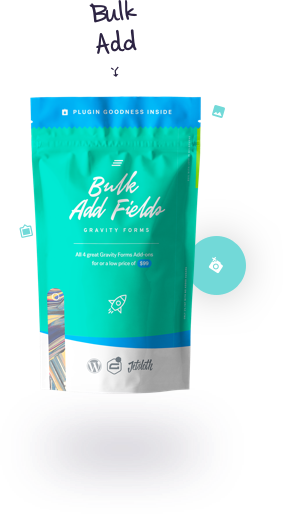 If you don’t already have these, we’ve got a Gravity Forms Sloth Bundle where you can purchase all 4 of our Gravity Forms add-ons for the cost of 3. Super saver right there. 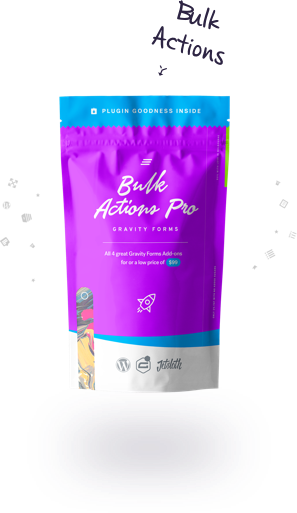 Grab the add-ons and install them onto your site. of course, make sure you have Gravity Forms installed too. 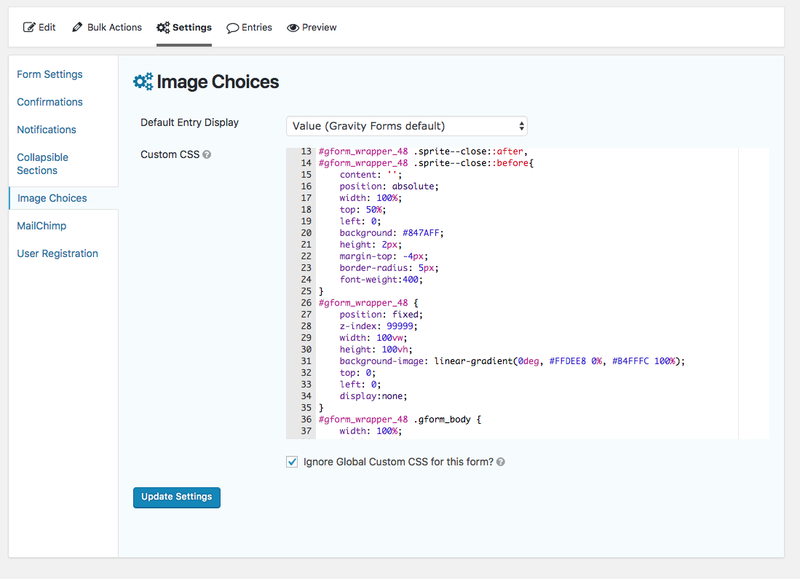 Using the custom CSS box found in the Image Choices plugin settings page, we styled and added all of our custom CSS. Within here we also added custom CSS styles to make our Collapsible Sections look great too. We added the Gravity Forms ID to each of the class names so that are styles would only be applied to the form we want, and the CSS would not affect any other form. Note the extra CSS ID “#gform_wrapper_48” in all of the CSS. Nothing too fancy here, but we thought we’d get tricky and have the support form initial hidden on the page. Then use jQuery to fade the hidden form into view when the user clicks the “Support Demo” button. We hide the form from the page by adding “display:none” to the forms wrapper class, in this case, #gform_wrapper_48. 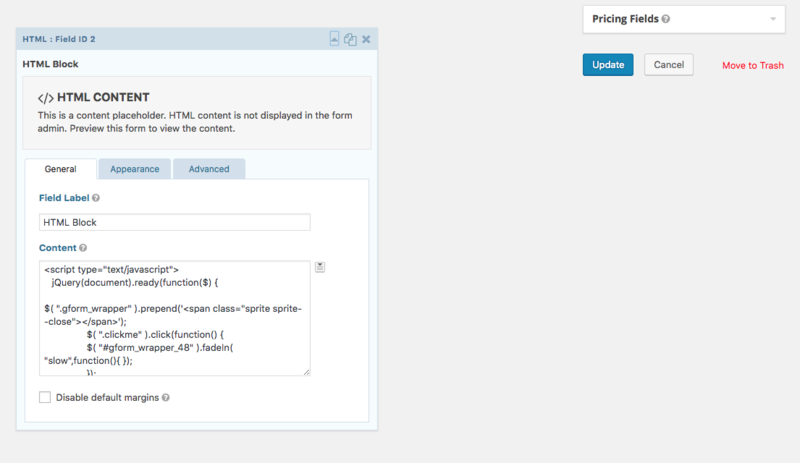 We then added a HTML field to the form itself, within that we added the required jQuery to show the form on button click. The resulting form looks great and much more engaging than our current support form. Even asking for support should be a nice experience don’t you think? We’ve still got some enhancements to make before we roll this form into our live support form, however, but it’s a great start. We’ll keep showing you great examples of how powerful Gravity Forms and JetSloth add-ons can be to making your forms looking great!